Hall of Fame jockey Javier Castellano did not have much time to celebrate his 5,000th-career win on Saturday at Belmont Park before catching a plane to Louisville to work Robert LaPenta, Madaket Stables, Siena Farm and Twin Creeks Racing Stables' Breeders' Cup Classic (GI) contender Catholic Boy five furlongs in 1:02.60 at 5:30 a.m. (all times Eastern) Sunday at Churchill Downs. Castellano and Catholic Boy broke from Thomas' stable pony at the six-furlong pole and started the five-furlong move through splits of :13.40, :26, :38.20 and :50.60 prior to galloping out six furlongs in 1:15.40 and seven furlongs in 1:28, according to Churchill Downs' clocker John Nichols. Castellano, who is named to ride Catholic Boy in the Classic, nearly echoed Thomas after he returned to Barn 41. 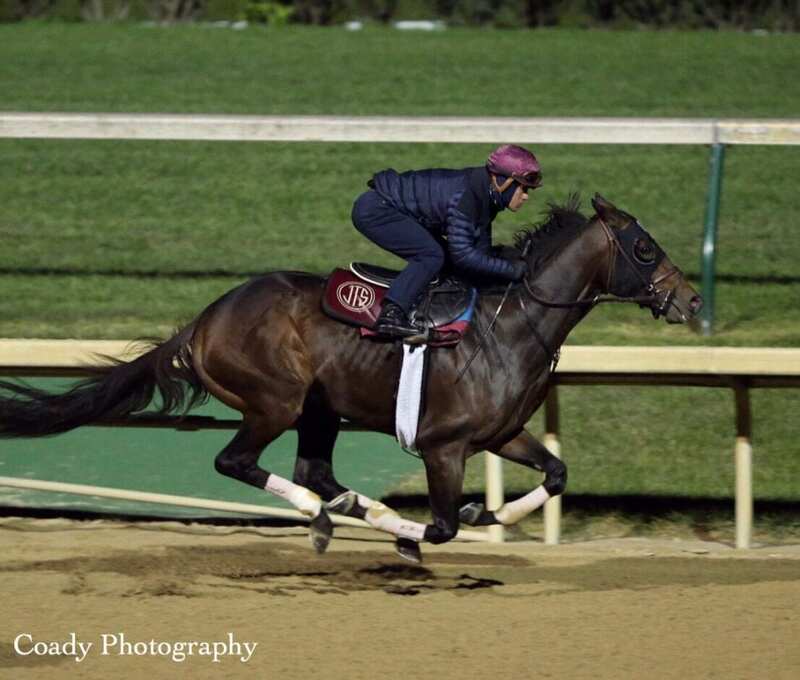 Catholic Boy, a 3-year-old son of More Than Ready, has won three-consecutive graded stakes races on both the turf and dirt: the June 2 Pennine Ridge (GIII) at 1 1/8 miles on turf; Belmont Derby (GI) at 1 ¼ miles on turf and Travers at 1 ¼ miles on dirt. Nearly four hours later, Hall of Fame trainer Bill Mott's Breeders' Cup Turf (GI) contender Channel Maker worked a half-mile in :49.20 inside of stablemate Prompt through opening fractions of :12.60 and :24.80. He galloped out five furlongs in 1:03. Also on the Saturday work tab was South Florida-based owner/trainer Juan Carlos Avila's Champagne Stakes (GI) fifth-place finisher Trophy Chaser, who breezed five furlongs in 1:01.40 with Castellano aboard in preparation for the Nov. 2 Breeders' Cup Juvenile (GI). Trophy Chaser, a 2-year-old colt by Twirling Candy, was an eye-popping 15 ¾-length winner in his second-career start at Gulfstream Park on Aug. 25 prior to the Oct. 6 Champagne. One of Trophy Chaser's likely competitors for the Juvenile is Hall of Fame trainer Steve Asmussen's Iroquois (GIII) runner-up Tight Ten, who blitzed five furlongs in :59.60 in company with stablemate Wilmington (five furlongs, 1:00.20). Tight Ten, owned and bred by Winchell Thoroughbreds, started about three lengths back of Wilmington, an 0-for-2 maiden, through opening splits of :12.20 and :35.80 before hitting the wire together and galloping out five furlongs in 1:13.60, according to Nichols. Rounding out the Sunday work tab was 2014 Breeders' Cup Classic runner-up Toast of New York, who breezed an easy half-mile in :53.60 for trainer Jamie Osborne. The now 7-year-old gelding, who was the second-place finisher behind Mind Your Biscuits in the Sept. 29 Lukas Classic (GIII) at Churchill Downs, could target the Breeders' Cup Classic or the 1 ¾-mile Marathon Stakes (GII) on Friday, Nov. 2, according to Osborne's assistant Jimmy McCarthy. Training hours at Churchill Downs will remain 5:30-10 a.m. daily until Saturday when the track will open at 5:15 a.m. There will be turf training available Tuesday from 9:45-10 a.m. and daily beginning Sunday, Oct. 28. For more information, visit: https://bit.ly/2PeXuHY. This entry was posted in Breeders' Cup, NL Article and tagged 2018 breeders' cup, belmont derby, Breeders' Cup, breeders' cup classic, catholic boy, channel maker, churchill, Javier Castellano, Jonathan Thomas, Toast of New York, travers, trophy chaser by Press Release. Bookmark the permalink.